This is a standard regulation set of playing cards featuring 52 unique, animated art images of characters from the popular animated series My Little Pony. This is the second series. This is a standard regulation set of playing cards featuring 52, unique, animated art images of characters from the popular animated series My Little Pony. 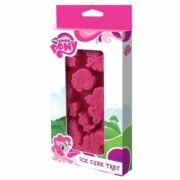 Now from the animated world of My Little Pony direct to your freezer comes this rubber ice cube tray featuring 8 cube slots of various Pony images and characters. This tray turns any cold drink into one that will help make you friends! Produced in 2013 this is a 12 ounce clear acrylic travel cup that features the animated art of My Little Pony. It is a double wall acrylic travel cup, comes with a straw and is BPA free. It is perfect for hydrating on the go, and the double wall keeps drinks cold! Hand wash recommended. 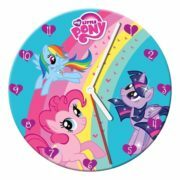 This is a 13.5″ cordless wooden wall clock featuring the animation art images of characters from the popular series My Little Pony. Produced in 2014, this is a licensed magnet measuring approximately 3″ long x 3″ tall featuring the animated character image of Apple Jack leaping out of a star as seen in the hit animated series My Little Pony. 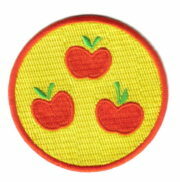 This is a licensed embroidered multi-color patch in the shape of Apple Jack’s cutie mark from the cultish animated series My Little Pony. It measures approximately 3″ x 3″. This amazingly detailed model starts as a 4″ square sheet and finishes as a 3-D model. 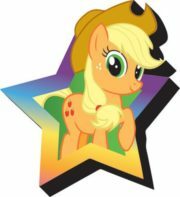 It is approximately 2.63″ x 1.14″ x 2.36″ when assembled and this one features Applejack from the popular animated TV series My Little Pony. The sheet contains detailed laser etching for easy removal. Complete instructions are included to show you how to pop out the pieces, bend the tabs, and connect them at the attachment points with an average assembly time of 30-45 minutes. We also offer an optional LED base or a Solar Spinner for better display of your model. 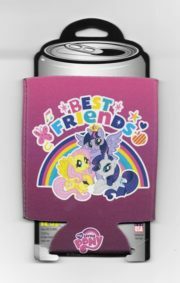 This is an illustrated, insulated, neoprene drink can cooler koozie huggie featuring characters from the My Little Pony animation series underneath the words Best Friends. 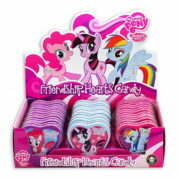 This is a box of 18 sealed tin cans of My Little Pony Friendship Heart Candies with an illustrated, embossed tin featuring Pinkie Pie, Twilight Sparkle and Rainbow Dash from the popular animated series My Little Pony. This is a set of 6 different, cardboard cartoon eyes of Pinkie Pie, Rainbow Dash, Twilight Sparkle, Applejack, Rarity, and Fluttershy from the cultish animated series My Little Pony. There is 1 set of eye glasses. The cardboard eyes are attached to the frame with a Velcro backing allowing for easy removal. 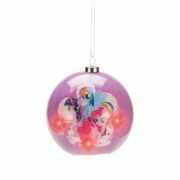 Produced in 2014 by Vandor, this is a 3″ diameter lightweight two sided ball Decoupage ornament with the art image of the main characters from My Little Pony with a light up LED. 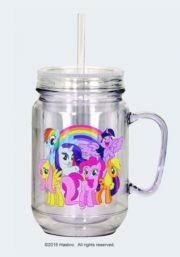 This is an illustrated, 16 ounce, clear, double wall, acrylic mason jar featuring the animated images of characters from the My Little Pony TV series in front of a rainbow. 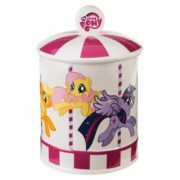 This is a 10″ + tall ceramic round cookie jar with the main character images from the animated TV series My Little Pony in a wrap-around design to resemble a Carousel. 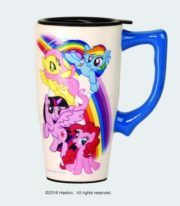 Produced in 2015 this is a new unused 14 ounce ceramic travel mug that features the animation art images of characters from the popular animated TV series MY Little Pony in front of a rainbow. 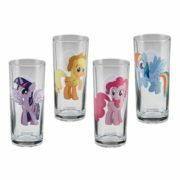 This is a set of four different 10 ounce drinking glasses, each bearing the image of a different cast member from the animated series My Little Pony. 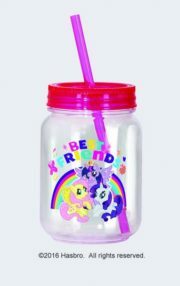 This is an illustrated, 12 ounce, clear, double wall, acrylic mini mason jar featuring the animated image of characters from the My Little Pony TV series under the words Best Friends. Featuring a collage of animation art images from the Popular My Little Pony TV series, this is a small insulated shopper tote. The insulated Interior Keeps Contents Cool or Warm and it has a Secure Velcro Closure with Bold and Bright Character Designs. Great for shopping and a good alternative to a traditional bag. It measures 9″ x 4.75″ x 10″ with a strap that features a 6 1/2″ drop. You can wipe clean with a damp cloth. 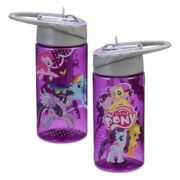 This is a clear violet tinted 14 ounce double wall Eastman Tritan water bottle featuring flying character art images from the hit animated series My Little Pony. 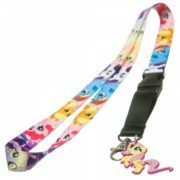 Produced by Bio World in 2012 is this 18″ long metal, cloth and plastic multi-color lanyard that is covered with a collage of images from the cult animated cartoon series My Little Pony. There is also a rubberized 3D charm of the figure of Dash attached at the bottom along with a 3 3/4″ x 4 1/4″ open plastic badge. It can be used to hold keys, name tags, membership and business cards and more. This is a mint, unused lanyard. Produced in 2015 this is a new and unused stoneware 20 ounce ceramic mug featuring the collage images of the various characters as seen in the popular animated TV series My Little Pony. On the back is the name logo and the phrase “Magical Friends” on the inside lip. 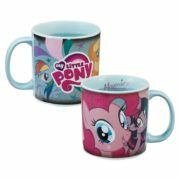 This is a heat sensitive mug so when filled with a warm liquid the Ponies disappear and only the eyes of Pinkie Pie remain and the name logo on the back. 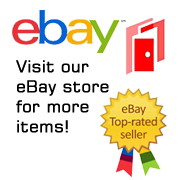 This is a licensed 4″ long embroidered multi-color rainbow patch in the shape of the figure of Dash flying from the cultish animated series My Little Pony.